The Twin Cities music scene isn’t short on poetic songwriters or singers with golden voices. Two local acts promoting new albums Thursday night at the Cedar Cultural Center have both those traits along with a lot of unique, interesting instrumentation to help set them apart. 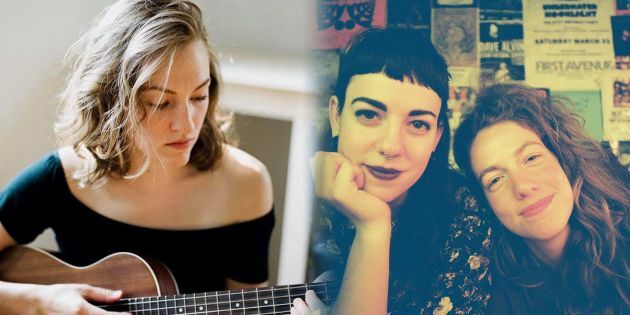 Headlining the dual release show will be Sister Spieces, an artful and sometimes quirky but still accessibly poppy duo with actual sisters Emily and Abby Kastrul. Emily plays accordion to Abby’s guitar, which already lends their songs a little extra layering and buoyancy. On their sophomore record “Heavy Things Do Move,” the musical siblings recruited a small army of horn players -- including many members of McNasty Brass -- to add even more bounce and beauty to their harmonies and evocative lyrics, the results of which at times variously recall Feist and My Brightest Diamond. Two songs on the album, “Swallow Me Whole” and “That Dries Out That Is Dust,” strip the music down to just piano and vocals – both to great effect. But the real catch here are all the opulent arrangements, which will be reproduced live with a new eight-member Sisters Species lineup heading to the Cedar on Thursday. Joining the celebration is Lena Elizabeth, the Minneapolis native and McNally Smith College of Music grad who caught our attention last year with her debut EP, "The Line." Now she’s touting her first full-length effort, “Get It Right,” which more broadly expands the warm and elegant but still often heavy and powerful style she first developed by using a bass ukulele as her primary instrument. One of the highlights, the title tracks finds her going to church Hozier-style. Other tunes incorporate strings and organ around her tight regular band, featuring Taylor Donskey (bass), Daniel Staddon (drums) and Jeff Krause (guitar). Thursday’s twofer release party will start at 7:30 p.m. Tickets are $12 advance via thecedar.org or will be $15 at the door of the Cedar, at 416 Cedar Av. S., Mpls. Here’s a taste of each of the new albums.